Old Crouch Endians - a Memory of Crouch End. I believe everyone who lived in Crouch End (also Muswell Hill) during the period 1941-71 were very lucky as the area offered virtually everything one would ever wish for. In fact, although I now live in Norfolk I retain very happy memories of good ol' Crouch End. My first memory of living there was playing on a carpet in my grandparent's back garden and watching a doodlebug roaring overhead, then being rushed into our air-raid shelter. I was born on 5 May 1941, a week or so prior to the end of The Blitz. I went to Rokesley School, then to Crouch End Junior School (which I hated). Then, failing the old Eleven Plus I attended Crouch End Secondary Modern where I seemed to come into my own. I featured in a number of operetta's, was vice captain of the school cricket team and of my house (HB - Household Battalion). I was a school prefect and was selected to attended the MCC cricket school at Alexandra Palace and I played for the borough of Hornsey. I also had trials for Middlesex. In my early teens any happy hours were spent on the bridge at Hornsey Railway Station collecting train numbers. Some Sunday mornings with a couple of friends, we would catch a local train from Hornsey to Kings X, after checking which engines were there and noting the numbers we'd nip on to St Pancras, Euston, Liverpool Street, then Waterloo before returning home for lunch. Thinking back, we in Crouch End were very well catered for regarding a choice of cinema. There was the Ritz and Odeon at Muswell Hill, the Rex East Finchley, the Rex and Gaumont Wood Green, not forgetting the ABC at Turnpike Lane whilst further along Green Lanes was the rather drubby Coliseum, Finsbury Park offered The Astoria and another Gaumont. We were also well catered for regarding variety entertainment courtesy of Finsbury Park and Wood Green Empire's. We all remember the 212 (now W7) bus which ran from Muswell Hill Broadway to Finsbuy Park Tube Station. Then there was the 41 from Archway to Tottenham Hale, and the 233 (now W2) which ran from Finsbury Park Tube Station to Northumberland Avenue, Tottenham. As a youngster I would take the 41 to Turnpike Lane then a trolleybus to Harringay Stadium, where I went every week as a keen supporter of the Harringay Racers speedway team. There were also visits to Harringay Arena for ice hockey and the massive Christmas Circus staged by Tom Arnold, not forgetting such ice shows such as Chu Chin Chow and Rose Marie. I saw the Tom Mix Rodeo at the Arena and the Don Cossack display team at the Stadium following which was a visit by the Hollywood Stunt drivers. In the late 30's my mother worked at Wilson's, she later worked at the then new Telephone House on Crouch End Hill, she was also good friends with the wife of the owner of Arctic Furs. My first grown up suit at the age of fourteen was courtesy of John Temple, although a year later Mum directed me to the finest of fine tailors, Raymond Mather who then made my suits, jackets, blazer and trousers for the next twelve years. Who remembers Palace Motors in Park Road, opposite Palace Road which was owned by Jack Flock and run by his sons Stan, Tony and John? Being taken to choose a toy (usually a Dinky car) at Souch's in Park Road was a great treat to a young lad. Next door to Mr Souch was a fish & chip shop, although the best fish & chips were at Gold's in Archway, my grandpa and I would get a 41 bus there to get wonderful skate chips and bring them back for supper at home. I often recall seeing Colin Chapman buzzing along Park Road in one of his Lotus sports racing cars. In fact the first Lotus was built in a workshop owned by Clive Claremont in Shanklin Road (off Park Road). Clive also owned a magnificent rare black American car, a Cord, which was often seen outside the Maynard Arms on the corner of Lynton Road, where my maternal grandparents lived. Opposite the Maynard was the surgery of firstly Dr Girling, secondly Dr Acres, then Dr Ellis. Chapman evntually opened his Lotus works next to Hornsey Railway Station. Thinking back to school holidays, Alexandra Palace was a wonderful playground, we would often hire a rowing boat and/or ride our bikes around the grounds. There was also the roller skating rink at Ally Pally, now an ice rink, damn it. I recall two stays in Hornsey Cottage Hospital, once for tonsils, then concussion, a wonderful old hospital. Next to the hospital was Hornsey Swimming Pool. 5/- old money for a season ticket, any day all day. After two or three hours of wafting around in the water at 53-57 degrees F and turning bluish, you could stagger shivering into the cafeteria for a hot bovril.The pool was next to one entrance to Crouch End playing fields where you could find numerous cricket and tennis clubs before arriving at Queens Woods. I shall not overlook Priory Park where we could play football or cricket although we were not permitted to ride our bicycles there. 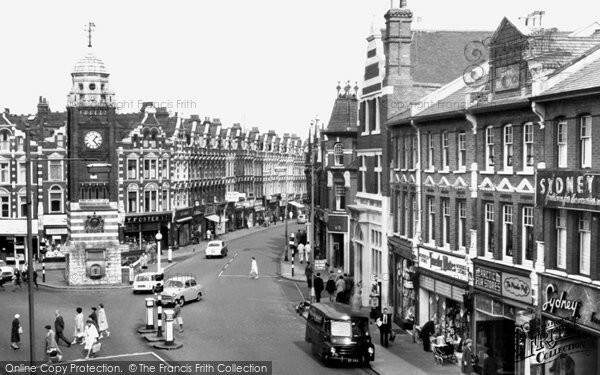 I left Crouch End in 1973 when I married and moved to Fulham, but by then there had been major council changes and Crouch End became very run down and dowdy, then like a Phoenix it rose again and is now, so I understand, a fashionable area in which to reside again.....good ol' Crouch End! A memory shared by Malcolm Cook on Apr 13th, 2014. Send Malcolm Cook a message. Lovely to read your article. I was thrilled that someone else remembers Palace Motors and the Flock boys who used to look very resplendent in their Teddy Boy suits in the 50s. My father opened one of the first ice cream parlours after the war directly opposite Hornsey Open Air swimming pool and I can remember Jackie Collins who was 14 at that time (same age as me) and her sister, Jackie Collins often coming in and sitting there enjoying Bunty's Specials. Park Road School used to run a nice youth club and I can remember hearing Heartbreak Hotel by Elvis Presley for the very first time standing outside on the corner. I remember Wilson's Department store and Kevan's, the school outfitter, where I had to get my school uniform for St. Kilda's Convent School and later for Hornsey High School. Yes, I too rmember Bunty's ice cream parlour where I would enjoy the odd peach-melba. I never attended the youth club at Crouch End Junior School but I do recall the club leader was called 'Jock'. My own choice of youth club was Carisbrooke in Colney Hatch Lane where I met many wonderful friends, some of whom I am still in touch with c/o Facebook.....I think zap1066 referring to school meant she attended St Gilda's prior to Hornsey High, but I cannot recall Stan, Tony or Johnny Flock wearing teddy-boy suits, in the late 60's and on we were all well suited and booted, the guys c/o tailors Toby Norman in Wood Green High Road and myself via Raymond Mather in Crouch End Broadway. I do remember Keevan's outfitters which was between my tailor and the Post Office.....all good memories....good ol' Crouch End, at thimes I wish I still lived there although Norfolk is an ideal county for me at my age! I went to Rokesley and Crouch End Junior. I was born in August 43 and can relate to almost everything you mentioned in your article. I ended up at Stationers. I lived in the Hope and Anchor pub during most of my school years. My brother went to C.E. secondary modern and my stepbrother was in the same class, and a close pal of, Colin Chapman. My sister was at Hornsey High. I've been to all of those cinemas. We used to call the Coliseum " the flea pit". I could go on but you've said most of it. Unlike you I really enjoyed my time at Crouch End Junior. Our head was Victor Kitchener and my tow teachers were mr Strickland and mr Lamb who was absolutely the best teacher I have ever come across. Rumour has it that he got 37 of his class of 43 through the 11plus but I can't vouch for that. PS I did a paper round up Crouch Hill and worked at Dunne's bakers on Saturdays. I wonder if you used the same tree for a wicket as we did in Priory Park? Yes, Crouch End was a great place to grow up in! Yes, happy memories as a medical student boarding at #5 Clifton Road owned by Miss Howell-The management. This was 1951-53. Played tennis at Muswell Hill and took girl out from there, Margaret Seymore. Michael Clark. Add a memory of Crouch End.